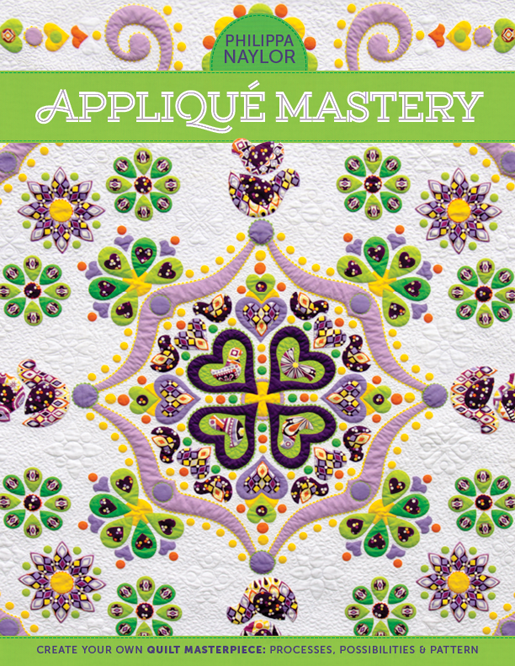 Linda Chang Teufel is owner and editor of Dragon Threads Publishing, and she’s giving us a behind-the-scenes look at their newest book, Applique Mastery: Processes, Possibilities & Pattern by Philippa Naylor. The book isn’t due out until this fall, but Linda is sharing one of the tips from the book – Perfect Satin Stitch Circles – as a special sneak peek for WeAllSew readers. As a quilt book publisher, I’ve had the honor to work with some very amazing artists over the 20+ years I’ve been in business. 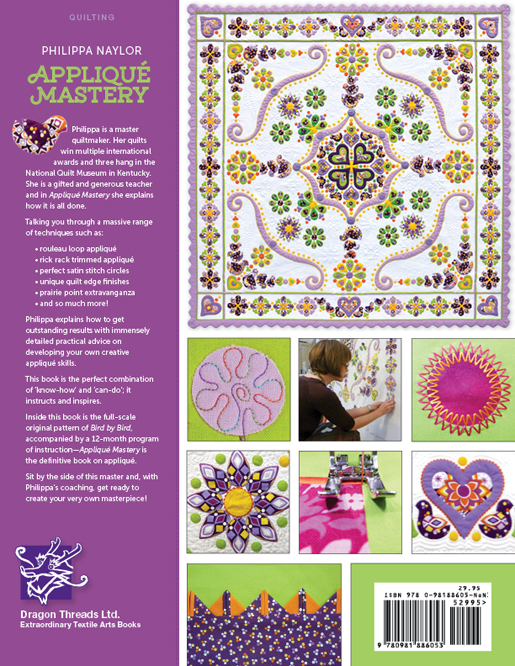 In 2006, we published a book by Philippa Naylor titled Quilting in the Limelight. Years before, I had seen her work hanging in the National Quilt Museum on my trip to AQS in Paducah, KY one year. Of course, the quilts, especially the Limelight one, took my breath away! I thought she would be a great candidate for a book but the museum tag said that she lived in Saudi Arabia…oh my! I didn’t know how I could contact her so I let it go. Then one year Jane Sassaman, author of Patchwork Sassaman Style and another award-winning quilt artist herself, said that she would be rooming with Philippa at the AQS show and would I like her to ask Philippa about writing a book for Dragon Threads…well yes!! So when Philippa and I met in Houston at Quilt Market that year, she agreed to write a book with us. It turned out to be a colorful book of her quilts with the twist of her story about driving from Saudi back to her native England with her family. Philippa has taught for years in Houston, with a waiting list for all her classes. She is a vibrant, very engaging teacher with lots of positive enthusiasm so you can’t fail to come out of her classes uplifted and with much knowledge of quilting techniques! 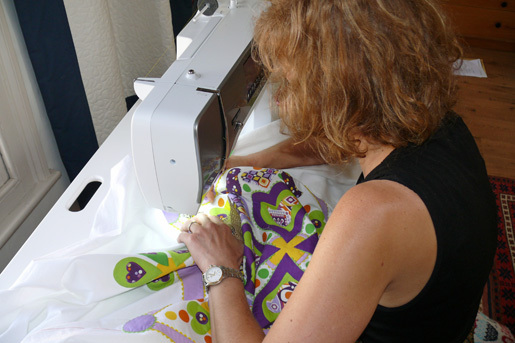 I think the difference in her methods is that she has years of formal training in garment sewing and she uses much of that as unique approaches to some complex quilting design. Right now she is finishing up another fantastic show quilt to enter in the major quilt shows but with one difference…it is part of our new book! We are including a pattern of “Bird by Bird” in the book, Applique Mastery: Processes, Possibilities & Pattern to be released this Fall. 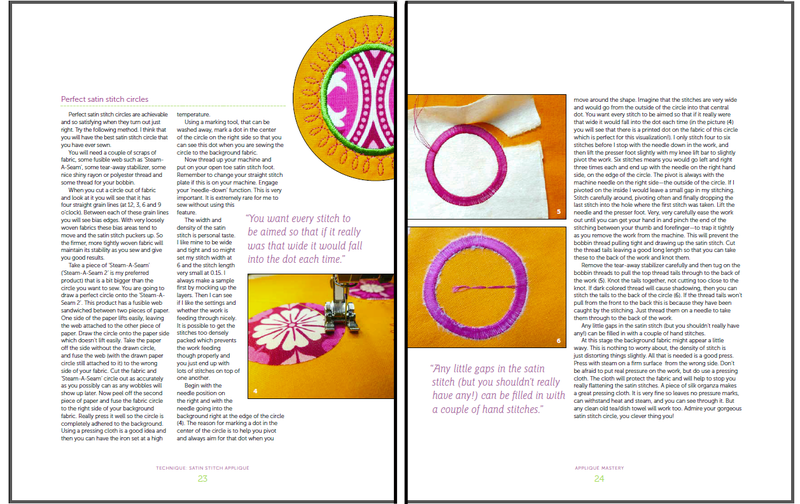 Here is one of the tips from Applique Mastery: Perfect Satin Stitch Circles. Will Philippa’s new book be available at the Houston Show? I’m not sure if this has been pointed out… but you didn’t mention layering up with the stabiliser in this article… It was mentioned in the supplies and then when trimming afterwards but not during the description of the ‘process’…. It may be that as this was an ‘excerpt’ it is unnecessary but I just thought I’d mention it… I have taken a class with Philippa with this technique and it does give a fantastic result. This is confusing. On the second page, you are told to tear away the stabilizer, but you’re never told to use stabilizer. Surely your editors should have caught this!